In Chiang Mai, a small city in northern Thailand that I’ve called home for several months, I’m surrounded by elephants. Not real ones, of course, but images of Asia’s sacred animal. They adorn clothing and souvenirs at the night markets. They’re the subject of art and statues. They’re pictured alongside beaming tourists on shiny travel brochures. This city is a major gateway to elephant tours in Southeast Asia and visiting the gentle giants is a big part of why travellers come to northern Thailand. For fun, I started collecting brochures for all the elephant tour operators I could find. I gathered more than 20, each making claims: “no riding” policies for example; how they served as “care homes”; how they practiced “elephant rescue”. Reading through the glossy trifolds, I found more questions than answers. From what, exactly, are we rescuing these creatures? And how are we, as travellers, supposed to know which operators are really doing what they claim to be doing? From those questions, this guidebook was born. 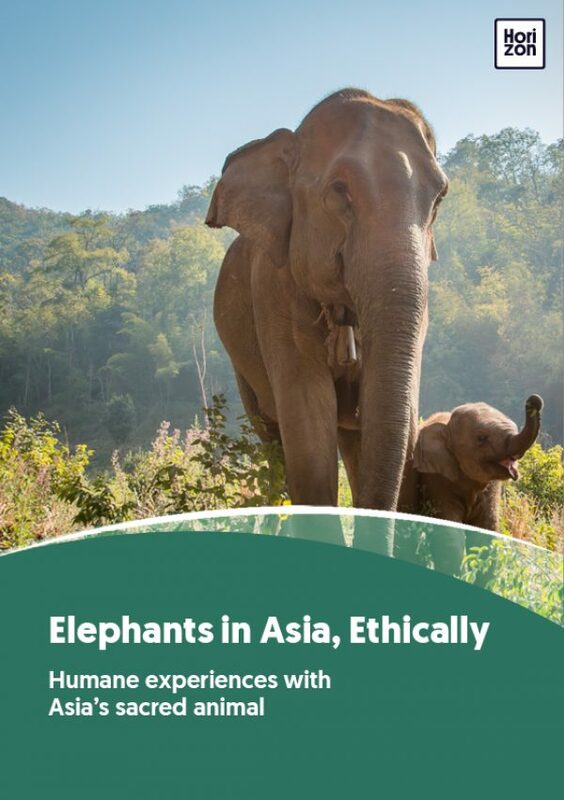 Travellers need help navigating the muddy waters of Asian elephant tourism, so we set out to look at this thorny subject, create a guide to the ethical issues, and how to choose tours responsibly. You’ll know. As soon as you look an Asian elephant in the eye, you’ll just know, as I did, what all the fuss is about. Spend more than a few minutes interacting with or just observing them, and you’ll get it. You won’t be the first to fall under their spell. Human-elephant relationships date back for centuries and elephants are revered in many Asian cultures. Tourists have been drawn to elephant attractions for decades. Truly a “charismatic megafauna,” the Asian elephant is for many, a rallying point for wildlife conservation. I admire Asian elephants for their cognitive prowess, their sentience, and their deep-rooted social bonds. They live for up to 70 years in the wild, organising themselves in matriarchal herds of eight to 20 members. Their use of tools and complex problem-solving makes them rare in the animal kingdom. They display self-awareness and empathy. They communicate through infrasound that we humans can’t perceive. If they could talk to us, they’d have quite a tale to tell. The narrative of elephants in Asia usually goes something like this: Once upon a time, hundreds of thousands of Asian elephants roamed free, inhabiting the healthy lush corridors of India and Sri Lanka, down into the jungles of Myanmar, Thailand, and Cambodia. Then along came human encroachment, and things started changing. Fast. Over the last couple of centuries, Asian elephants have lost huge swaths of their habitat and populations have plummeted, with numbers down into the tens of thousands. On top of that, elephants were taken into captivity at alarming rates. They became beasts of burden, spirit-broken and forced to drag heavy trees for the logging industry. In Thailand, when commercial logging was banned in 1989, thousands of captive elephants were left “unemployed”. Their owners needed to find ways to continue to pay their huge food and care bills (maintaining elephants in captivity is not cheap!). Some took to the streets of Bangkok and other big cities to beg with their elephants. Others entered the burgeoning elephant tourism trade, where the animals were trained harshly to give rides and do tricks for travellers. That brings us to today. Asian elephants have dropped in numbers to the point of endangerment as a species – at risk of extinction within three generations – and a large number live in captivity. Why can’t we simply return them to the wild? Because there’s not enough intact, protected wilderness area left. The owners of captive elephants depend on tourism dollars to feed and house their animals. And as long as there’s a cash market for more elephants in tourism, they’ll continue to be extracted from the wild. The dilemmas are piling up. In my journey through the landscape of elephant tourism in Asia today, I’ve met an amazing cast of characters. I’ve heard from storytelling travel bloggers who have spent anywhere from a few hours to several years with Asian elephants. I’ve reached out to activists and advocates at non-profit organisations doing inspiring things in the field of elephant conservation and welfare. I’ve interviewed a lively pair of wildlife tourism inspectors. I’ve learned from the scientific community about what we know and what we don’t. Finally, I’ve gotten up close and personal with mahouts (traditional elephant handlers, whose voices go largely unheard), and elephants themselves, rescued from cruel pasts and with the scars to prove it. This book is a collection of their voices, their stories, their perspectives. In these pages, you’ll hear from some of the most vocal experts in the field. Spoiler alert: they’ll disagree. There are significant research gaps on elephant training methods. Opinions run strong on the ethics of elephant riding and other tour activities. Discourse has become polarised and emotive. While strong Western viewpoints abound, it is harder to find local voices willing to put their heads above the parapet. I've come to realise there are no clear, tidy answers. As I sought out who to ask about elephants and tourism here in Asia, I came full circle. We need to ask ourselves. The questions are left for us, as travellers and as humans: what kind of elephant experiences will we demand? Do we insist on up-close, selfie-ready encounters? Or can we move on to something a little more in-the-wild, more distant, more hands-off? The decision is yours to make.